Inshore fly fishing in Charleston, SC is the best way to experience Redfish. These fish are mean, aggressive, and can reach sizes upwards of 50lbs+. Catching them on the fly is as exciting as it is practical. Found in shallow water, sight fishing makes casting a dream. The flat inshore waters are protected from the heaviest ocean breezes, which means fishing is open almost every day of the year. What Kind Of Gear Do You Need For Redfish Fly Fishing? While some Redfish get big, the majority are caught are under 15lbs. This makes it more practical to be caught and landed with friendlier weighted fly rods. We recommend using 9 foot, 8 weight rod. Anything close to that size should be perfect for inshore fishing near Charleston, SC. A good leader length is between 9 and 12 feet. As long as it tapers to a 15 or 20 pound tippet, you should have more than enough strength to bring in most Redfish. Any monsters are going to demand some skill. Even though it’s an estuary, the brackish water will quickly eat away most freshwater fishing reels. Make sure your gear is prepared for the ocean and you shouldn’t have any trouble. Shallow water is full of silt and mud. Redfish rely on their eyes, especially during daylight hours, which means getting them to see a fly is the first hurdle to overcome. All that mud in the water means diminutive flies aren’t going to get any attention. Redfish are stalking grasses and mudflats, looking for baitfish and crustaceans that are caught in the current. These fish are hungry. That means you can throw baits from 3 inches long to as large as 6 inches. Don’t skimp on the patterns you’re throwing. White, purple, red, chartreuse, depending on the conditions any color could be what they’re hitting. We like to use baits with exaggerated eyes, anything to grab the Redfish’s attention. It’s not always about looking natural. Sometimes a reaction strike is easier to get. Although the water is shallow, its doesn’t make getting to it any easier. Charleston, SC is home to hundreds of miles of shallow mudflats and grass beds. 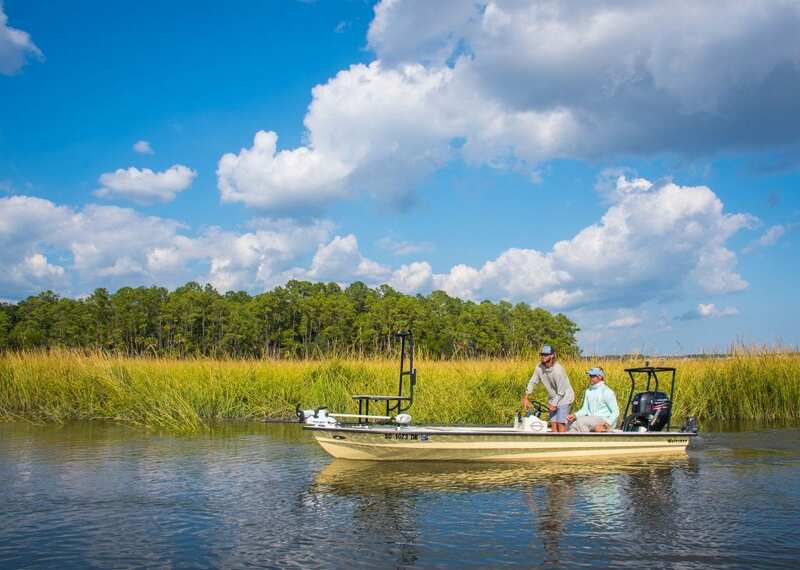 Lacking a road or stable land to walk on, a boat is your best option to enjoying a successful day of fishing. We support DIYers as much as the next guy but the salt flats of South Carolina are too vast to do it by yourself. Our boats can reach water merely inches deep, which is going to be needed when hunting down schools of fish. All boats come with a professional captain/guide who has years of local fishing experience. When the full moon and high tide coincide, the fishing gets really crazy down here. Waters pour into shallow grass beds, allowing bait fish and crustaceans new feeding grounds. Redfish enter the shallow beds, which makes them hard to find but rewards the most dedicated anglers. Sight fishing can put you onto some monsters. When they’re this shallow, having a guide will ensure you go to where the fish are. Hook into some trophy redfish. Fly fish with the best at RedFin Charters, contact us today.